If you’re not familiar with the Visual Capitalist, I highly recommend that you check out the website and signing up for the daily email. Content is always visually stunning and covers a broad range of topics. Yesterday’s post – The Base Metal Boom: The Start of a New Bull Market? – by Nicholas LePan is an excellent one, although the timing was unfortunate. Base metal prices took it on the chin overnight as The Donald announced that the US will potentially slap tariffs on another $200 billion of goods from China after August 31. While I agree with the Visual Capitalist article that the electric vehicle boom and electrification of everything will drive the next metals boom, the immediate reality is that base metal consumption growth is totally driven by China. This growth isn’t from the Chinese making lots of EVs and installing solar panels everywhere; for the time being, it is still primarily from infrastructure growth and economic expansion. 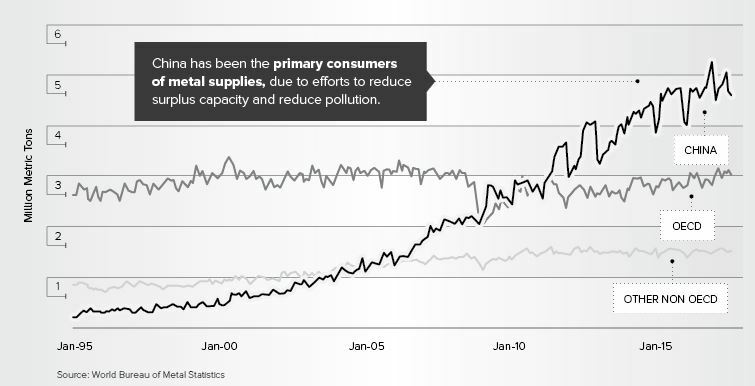 The chart below, extracted from the Visual Capitalist piece, shows China’s dominance in metal consumption. 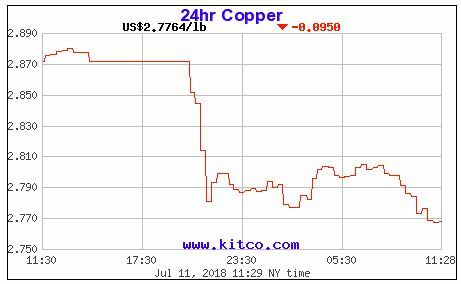 Therefore, when the U.S. announces tariffs on $200 billion of goods, it makes sense that base metals fall. Those tariffs will potentially reduce China’s exports, which in turn will slow China’s growth and its consumption of base metals. That is why copper prices dropped 3.6% overnight, bringing the one month decline to 16%. It used to be said that copper has a PhD in economics. Perhaps that was true in the past, but that is no longer the case . 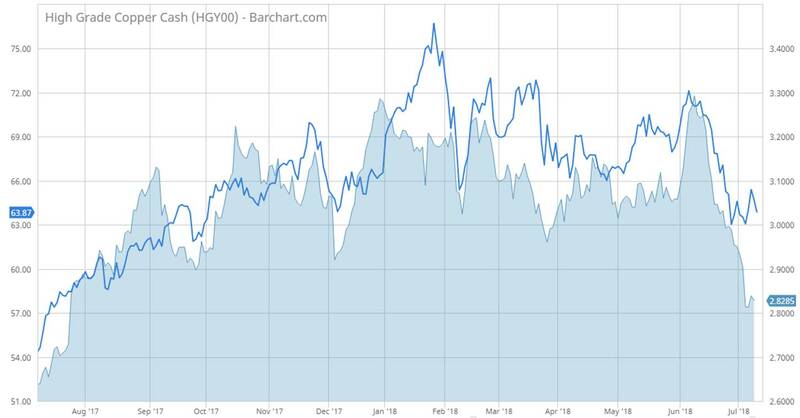 Now it would be more apt to say that copper has a PhD in China economics and the chart below of copper prices (area chart, right axis) compared to the iShares MSCI China Index Fund (blue line, left axis) shows the strong correlation. The fate of us mining investors is solidly in the hands of the China economy and, consequently, U.S. policies aimed at China. What are the investment ramifications of all these tariffs? China certainly doesn’t look like it is going to back down, so expect retaliatory measures. That could lead to additional tariffs from Trump, since China exported about $500B of goods to the US last year. China only imported $130B of US goods, but it has other non-tariff ways of retaliating as outlined by Bloomberg. In other words, expect ongoing tariff noise in the markets for at least the next couple of months. I won’t get started on my views on politics or global trade. My views won’t change anything and I don’t get upset by things that I cannot change. Instead, I try to identify ways to make money (or avoid losing money) from the changes made by bonehead politicians. In this case, I think we will see short-term investment opportunities created from the ongoing US-China trade war. In the short-term, I think the trade war sets up trade opportunities in equities. The trade war creates uncertainty and uncertainty equals risk to investors. As a result, we are seeing a selloff of base metals stocks. Panic selling is likely to be overdone, so I think there will be trading opportunities in stocks like First Quantum (TSX:FM). As always, this post should not be construed as investment advice, consult your own broker, do your own due diligence, etc. etc. This is a high risk approach that is not for the faint of heart or those who can’t afford to lose money – equities trading is a lot like gambling. I’m just blogging here to tell you how I approach these situations and to help me crystallize my own thoughts into actionable ideas, not to provide advice. First Quantum stock is volatile and liquid, making it a great trading stock. As I write this, FM’s share price is down 7.5%. Don’t worry about whether that is too much, too little, or just right. In the short-term, fundamentals don’t matter. It’s more about investor psychology. The way I approach these situations is that I don’t typically buy the sell-offs on the first day. Typically it takes three or four days for a sell-off to run its course. The other tool I find very useful for picking entry points is Bollinger Bands. Take a look at the First Quantum chart below with Bollinger Bands showing two standard deviations from the 20-day moving average. There have been three instances in the past year where rapid sell-offs have taken the stock significantly below the lower band and in each case the stock has bounced back quickly. That’s the trading set up I’m looking for and I did actually buy FM two weeks ago at $17.72. Based on the current lower band, as well as technical support levels, I’d buy FM if it dropped to $16.50 to $16.75 in the next few days. Bollinger bands are dynamic, driven by moving averages, so the entry point will change on a daily basis and intuition does come into play. I try to wait until I see signs that the stock is stabilizing before buying, rather than just catching a falling knife. Once I’m in, the tougher question is when to sell the stock. If this is a short-term trade as opposed to an investment, then sometimes I sell intraday so as to not carry risk overnight. That’s what I did the last time I bought FM because it was just before a long weekend. If I hold the position, I always consider a stop loss or selling at a loss if the stock doesn’t bounce to preserve my capital. If the stock bounces, which happens more often than not, then consider putting on a trailing stop loss (something I only do virtually rather than in actual practice) or selling when stochastics exceed 80, indicating that the stock is getting overbought. 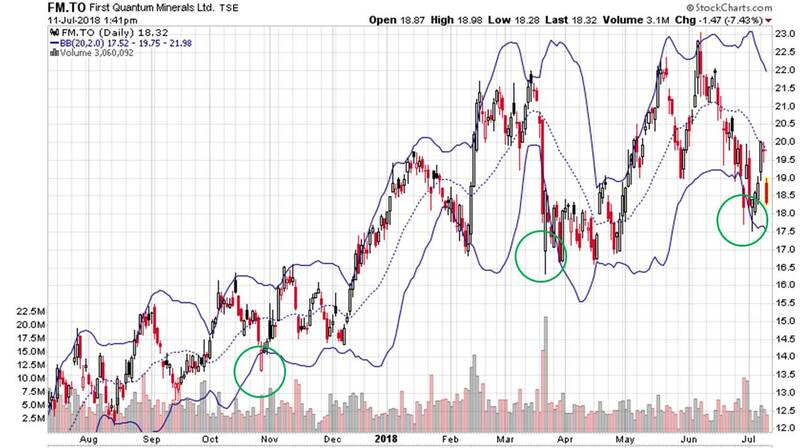 Since I don’t think the trade war noise is likely to go away any time soon, I am reticent to have much long-term exposure to mining stocks, especially juniors, at the moment. I’ll hold my Tinka Resources (TSXV:TK) stock because I work for the company and believe that the near term exploration potential and longer-term takeover potential outweigh the prevailing bearish zinc sentiment. On other junior and senior mining stocks, I believe that we will see better entry points in the coming months. I am still a believer that mining stocks will do well, just as they typically do in the latter part of the economic cycle. Likewise, regardless of whether a US trade war with China is real or rhetoric, China will continue to grow, electric vehicles will become more dominant, and electrification and battery storage will increase metals demand. If you liked Cobalt before, all of the reasons to like it are more or less still intact but now you can buy Cobalt 27 (TSXV:KBLT) for under $8 rather than paying $12 or $13. That stock is looking very interesting at these prices. First Quantum still seems expensive to me as a long-term buy, perhaps because Rio Tinto recently came out and said they would pay a big premium for good copper assets. I’m sure Rio Tinto doesn’t read my blog, but if they did I would recommend not talking up copper asset values when you’re looking to buy them. In addition to Cobalt 27, I think Trevali (TSX:TV) looks quite interesting at the moment. That stock is at a 2-year low, which seems very overdone relative to zinc fundamentals. I have lots of zinc exposure through Tinka, otherwise I’d be taking a serious look at Trevali both as a short-term trade (Q2 production will be announced July 18) or maybe as a long-term buy. Sure zinc prices have declined over the last six months, but that helps ensure that there is no demand destruction or excess new supply. In other words, the zinc market looks like it may remain balanced and that’s a good thing.